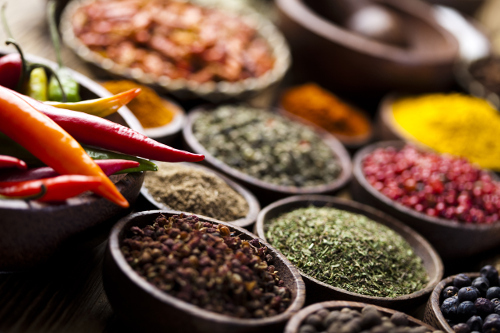 The addition of herbs and spices to your meals is a great way to enhance the flavor of your food. This is nothing new; however, you may not know the health benefits associated with herbs and spices. Weight loss is one of the unexpected advantages of adding flavor to your food. Diet in general plays a large role in maintaining a healthy weight. When done right, the foods you eat can reduce the risk of all health conditions associated with obesity, especially diabetes, high blood pressure, heart disease, joint problems, and even various cancers. What role do herbs and spices play with weight loss and obesity? This article will explain which herbs and spices are most beneficial for your weight loss plan. Your food will never be the same again! Maybe you began a weight loss diet for the New Year, and you’re looking for flavorful meals that fit within the criteria of your plan. You may be surprised to know that many powerful herbs and spices have been studied for their weight loss abilities. I want to show you that weight-loss food should never be bland or boring. You should always enjoy your food. It’s as simple as that. Some people cheat on their diet plan because it lacks taste or flavor. So, try adding flavor to help you lose weight. The following are 10 herbs and spices that may help you take your weight loss game to the next level. Turmeric is native to southern India and Indonesia, where it has been used medicinally for thousands of years. Scientific evidence now supports turmeric for weight loss. A study published in the journal European Review for Medical and Pharmacological Sciences found that the potent phytonutrient in turmeric called curcumin significantly improves weight loss and lower body fat, body mass index (BMI), waistline, and hip circumference. Other studies indicate that curcumin can improve insulin sensitivity and ameliorate weight gain and fat accumulation in the fat tissues and liver of obese mice. Curcumin may also help reduce leptin resistance. This is important because leptin is a hormone that informs the brain when we are full and should stop eating. Historically, pepper was used to honor the gods and pay ransoms and taxes. Nowadays it adds some zest to your meal, and has loads of health benefits, including weight loss. Piperine is the main compound in black pepper that gives the spice its pungent flavor, and it is also a powerful weight loss agent. One study found that piperine up-regulates resting muscle metabolism, demonstrating its potential as a treatment for obesity. Another study published in the journal Chemico-Biological Interactions in 2014 showed that pepper is an effective weight-reduction treatment. It may also improve other key factors for weight issues, including insulin sensitivity and leptin sensitivity. Rosemary is used to add flavor to beef, poultry, lamb, and various vegetable dishes; however, it may also reduce the risk of obesity. Carnosic acid is a major bioactive compound found in rosemary extract. A study published in the Journal of Agriculture and Food Chemistry in 2015 found that mice fed a high-fat diet with rosemary extract experience a reduction in fat, body weight, glucose and insulin levels, liver weight, liver triglycerides, and liver markers like alanine transaminase (ALT) and aspartate transaminase (AST). The researchers concluded that rosemary may be promising in the reduction of metabolic syndrome and obesity. The ancient Romans and Greeks regarded dill as a sign of wealth and valued it for its healing properties. Weight loss is among the health benefits of dill. In a study published in the Pakistan Journal of Pharmaceutical Sciences in 2015, researchers found that dill was able to significantly reduce body weight and food intake. This is thought to be due to the serotonin neurotransmitter precursor called 5-HTP (5-hydroxytryptophan). The increase of 5-HTP levels subsequently increased satiety for the study. As a result, there was a reduction in food intake and body weight. Fenugreek seeds have a somewhat bitter taste like celery; however, they also contain weight loss-promoting abilities. The soluble dietary fiber galactomannan is extracted from Canadian-grown fenugreek seeds. A study published in the Journal of Clinical Biochemistry and Nutrition in 2008 found that fenugreek fed to rats reduces body weight, total cholesterol, and triglyceride levels. Other studies have found that fenugreek is a weight gain preventative by improving lipid and glucose metabolism, while also enhancing insulin sensitivity, and down-regulating fat-forming enzymes. Besides adding to desserts, cinnamon is also very versatile for fish, black beans, and smoothies. No matter how you use it, cinnamon is great for boosting metabolism. It may also help regulate blood sugar, which could make it ideal for overweight individuals with diabetes or pre-diabetes. Research indicates that cinnamon can significantly lower blood sugar levels, total cholesterol, and LDL (low-density lipoprotein) cholesterol levels in type 2 diabetics. The phytochemical chemical capsaicin found in cayenne pepper is responsible for the hot flavor. It may also help fight obesity through the reduction of fat buildup by triggering beneficial protein changes in the body, according to a study published in the Journal of Proteome Research in 2010. Part of the weight loss benefit may be due to capsaicin’s heat potential because as a thermogenic substance, it may temporarily increase thermogenesis in the body. Thermogenesis is where the body will burn fuel like fat to create heat and impact metabolism and fat storage. Other research published in the International Journal of Obesity in 2010 suggests that consuming thermogenic ingredients like cayenne pepper may help you burn fat up to 16% and boost metabolism by up to 5 percent. Ginger is another common Indian spice that can also be juiced or used in a smoothie for optimal health benefits. The anti-inflammatory spice reportedly helps soothe and relax the gastrointestinal tract, while research published in the journal Metabolism in 2012 also suggests that ginger’s thermogenic properties will boost metabolism and suppress appetite. As a result, ginger has a potential role in weight management. Cumin is another herb quite popular in Indian and Middle Eastern cooking. It is the seed of a small plant from the parsley family that Greeks, Romans, and Egyptians used in high regard for thousands of years. Now, according to a 2016 study published in the Iranian Red Crescent Medical Journal, taking high doses of cumin and lime for an eight-week period can have a beneficial effect on weight, BMI, total-cholesterol, and LDL (low-density lipoprotein)-cholesterol levels in overweight subjects. Cumin works well in homemade taco seasoning, hummus, and guacamole. If you can get past the temporary bad breath effects, then eating garlic may also help your body burn fat. A study published in The Journal of Nutrition in 2011 found that mice fed a diet with garlic achieved more weight loss than mice that didn’t consume garlic. The results suggested that the garlic anti-obesity effects were at least partly facilitated by AMP-activated protein kinase (AMPK) activation, decreased expression of multiple genes involved in adipogenesis, and increased thermogenesis. It is good that garlic can be added to almost anything, and it especially adds flavor to roasted potatoes, sautéed vegetables, and various dressings. It all starts with a whole foods diet to help heal the body and support weight loss. Herbs and spices are often taken for granted. They’re simply added to soup, meat, or dressings for flavor, without a thought about the powerful health benefits contained within them. Incorporating different weight loss-promoting strategies couldn’t be any more valuable than it is today. Two in three adults are considered overweight or obese. The problem has reached epidemic portions. Luckily, there are a seemingly endless amount of weight loss strategies at our fingertips. The aforementioned herbs and spices are certainly a beneficial add-on for your weight loss/whole foods diet approach. However, it’s important to keep in mind that it is only part of weight loss plan. Consume a well-balanced diet of healthy fats, high-fiber fruit and veggies, lean proteins, and always drink plenty of water. Thorne, T., “5 Common Kitchen Herbs and Spices for Weight Loss,” GreenMedinfo, March 8, 2017; http://www.greenmedinfo.com/blog/5-common-kitchen-herbs-and-spices-weight-loss. “10 Spices, Herbs That Aid Weight Loss,” Mercola, Nov. 26, 2012; http://articles.mercola.com/sites/articles/archive/2012/11/26/herbs-and-spices.aspx. Brabaw, K., “13 Herbs and Spices Scientifically Proven to Help You Lose Weight,” Prevention, Jan. 6, 2016; http://www.prevention.com/weight-loss/herbs-and-spices-for-weight-loss. “15 Herbs & Spices That Help You Lose Weight,” DailyHealthPost, May 6, 2013; https://dailyhealthpost.com/15-herbs-spices-that-help-you-lose-weight/. “Overweight and Obesity Statistics,” National Institute of Diabetes and Digestive and Kidney Diseases; https://www.niddk.nih.gov/health-information/health-statistics/Pages/overweight-obesity-statistics.aspx, last accessed April 4, 2017. Lee, M.S., et al., “Reduction of body weight by dietary garlic is associated with an increase in uncoupling protein mRNA expression and activation of AMP-activated protein kinase in diet=-induced obese mice,” The Journal of Nutrition, November 2011; 141(11): 1947-1953, doi: 10.3945/jn.111.146050. Taghizadeh, M., et al., “The Effect of Cumin cyminum L. Plus Lime Administration on Weight Loss and Metabolic Status in Overweight Subjects: A Randomized Double-Blind Placebo-Controlled Clinical Trial,” Iranian Red Crescent Medical Journal, May 23, 2016; 18(8): e34212. https://www.ncbi.nlm.nih.gov/pubmed/27781121. Mansour, M.S., et al., “Ginger consumption enhances the thermic effect of food and promotes feelings of satiety without affecting metabolic and hormonal parameters in overweight men: a pilot study,” Metabolism, October 2012; 61(10): 1347-1352, doi: 10.1016/j.metabol.2012.03.016. Joo, J.I., et al., “Proteomic analysis for antiobesity potential of capsaicin on white adipose tissue in rats fed with a high fat diet,” Journal of Proteome Research, June 4, 2010; 9(6): 2977-2987, doi: 10.1021/pr901175w. Hursel, R., et al., “Thermogenic ingredients and body weight regulation,” International Journal of Obesity, April 2010; 34(4): 659-669, doi: 10.1038/ijo.2009.299. Mateljan, G., The World’s Healthiest Foods: Essential Guide for the healthiest way of eating (Seattle: George Mateljan Foundation), 700, 702, 710, 714. Bano, F., et al., “Anethum graveolens seeds aqueous extract stimulates whole brain 5-hydroxytryptamine metabolism and reduces feeding behavior and body weight in obese rats,” Pakistan Journal of Pharmaceutical Sciences, January 2015; 28(1): 221-225. https://www.ncbi.nlm.nih.gov/pubmed/25553698. Srichamroen, A., et al., “The Modifying Effects of Galactomannan from Canadian-Grown Fenugreek (Trigonella foenum-graecum L.) on the Glycemic and Lipidemic Status in Rats,” Journal of Clinical Biochemistry and Nutrition, November 2008; 43(3): 167-174, doi: 10.3164/jcbn.2008060. Handa, T., et al., “Effects of fenugreek seed extract in obese mice fed a high-fat diet,” Bioscience, Biotechnology, Biochemistry, June 2005; 69(6): 1186-1188. https://www.ncbi.nlm.nih.gov/pubmed/15973051. Nogara, L., et al., “Piperine’s mitigation of obesity and diabetes acan be explained by its up-regulation of the metabolic rate of resting muscle,” Proceedings of the National Academy of Sciences of the United States of America, Nov. 15, 2016; 113(46): 13014. https://www.ncbi.nlm.nih.gov/pubmed/27799519. BrahmaNaidu, P., et al., “Mitigating efficacy of piperine in the physiological derangements of high fat diet induced obesity in Sprague Dawley rats,” Chemico-Biological Interactions, Sept. 25, 2014; 221: 42-51, doi: 10.1016/j.cbi.2014.07.008. Zhao, Y., et al., “carnosic acid as a major bioactive component in rosemary extract ameliorates high-fat-diet-induced obesity and metabolic syndrome in mice,” Journal of Agriculture and Food Chemistry, May 20, 2015; 62(19): 4843-4852, doi: 10.1021/acs.jafc.5b01246. Di Pierro, F., et al., “Potential role of bioavailable curcumin in weight loss and omental adipose tissue decrease: preliminary data of a randomized, controlled trial in overweight people with metabolic syndrome. Preliminary study,” European Review for Medical and Pharmacological Sciences, November 2015; 19(21): 4195-4202. https://www.ncbi.nlm.nih.gov/pubmed/26592847. Ding, L., et al., “Curcumin rescues high fat diet-induced obesity and insulin sensitivity in mice through regulating SREBP pathway,” Toxicology and Applied Pharmacology, Aug. 1, 2016; 304: 99-109, doi: 10.1016/j.taap.2016.05.011. Anderson R., et al.,”Cinnamon extract lowers glucose, insulin and cholesterol in people with elevated serum glucose,” Journal of Traditional and Complementary Medicine, April 18, 2016;6(4):332-336. doi:10.1016/j.jtcme.2015.03.005.